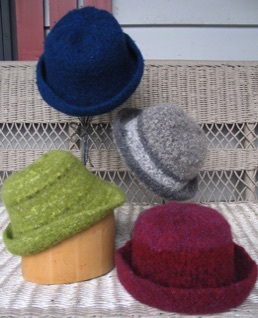 Wool hats are hand-knit with wool yarns. 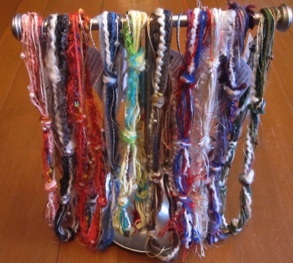 Some may even contain handspun yarn and/or eyelash yarn. 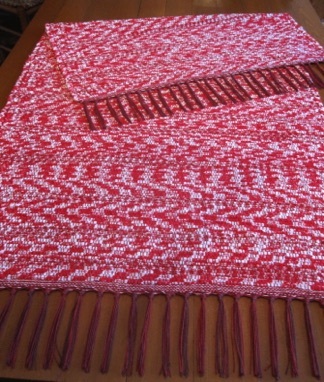 After knitting, they are machine washed to felt them. Note that the brim may be turned up or down, as you please. Each hat is unique in color, and texture, depending on the yarn I used during knitting. Have a color in mind? Just ask and I’ll see what yarns I have in stock! These extremely thick, warm clogs are the result of becoming a grandmother... 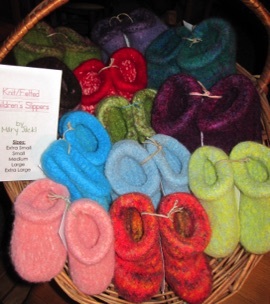 I love to felt, and our granddaughter just HAD to have warm feet! 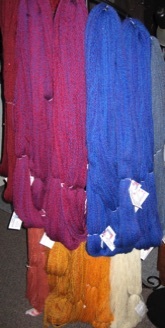 100% wool; each pair is a different color combination, and some even contain exotic fibers such as mohair. They come in child’s sizes X-Small through X-Large, and Women’s Small through Men’s Large. Handspun Yarns: $6.00/oz. plus tax; all skeins are labeled in ounces, grams, and yards. 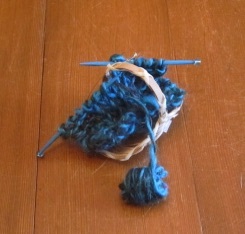 I have a great variety of hand-spun, 2-ply yarn available at the studio. A rainbow of colors. A variety of lengths. Fibers that range from super-wash merino, to wool from our own sheep. Some are even beaded! It’s impossible to show each of the skeins properly, so just ask to see what I have on hand, or stop on by the studio and take a look. These fiber necklaces are one of my latest additions...each one is different. Novelty yarns, metallic cording, pearl cotton, thread, beads, and even my own hand-spun yarns find there way into these versatile pieces of jewelry. May be wound on wrists to create a gorgeous bracelet, too! 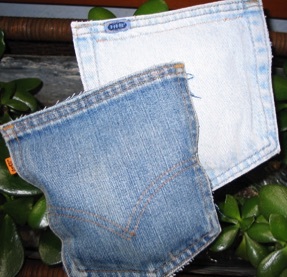 Stuffed inside these denim pockets is a generous amount of our catnip grown here on the farm. The cats go crazy for this scent! These ornaments are my original designs. 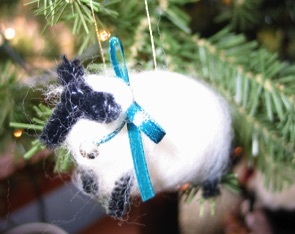 The sheep is made from our own wool, and the knitting basket ornament is knit from my own handspun yarns. Colors vary for each. 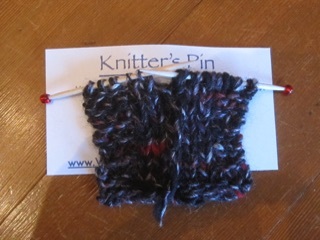 These pins are hand-knit exclusively of my hand-spun yarns. Some have beads plied into them as well. Colors vary. Each pin is approximately 2.5” x 2.5”. 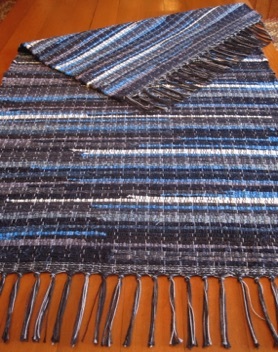 Handwoven Rugs: $5.00/sq. ft. plus tax; priced after they've been washed and dried. Last, but not least, are a seemingly unlimited range of colorful "rag" rugs. 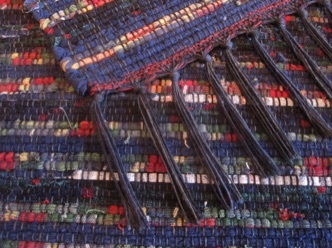 Each is lovingly woven on one of my two old looms. I re-cycle a wide variety of fibers such as denims, corduroys, tablecloths, blankets, cotton shower curtains, wool and cotton clothing, upholstery fabric, etc. See best selection here at the studio each spring. "If we're home, we're open." Contact us and we'll ship our products anywhere for you!